According to the Action Plan, “the workplace provides a significant opportunity to promote healthy lifestyles, as more than half the UK population are currently in employment and it is estimated that people may spend up to 60% of their waking hours in their place of work”. A principle area in the fight against obesity is ensuring that people not only have a better knowledge of healthy eating, but are also motivated and supported in making appropriate lifestyle choices. For this, action is required from a number of agencies, including employers, health professionals, media, catering and the food industry. The British Dietetic Association (BDA), the professional association for dietitians, aims to bring these organisations together, and is launching a nationwide campaign in June to help empower workers and employers to be more ‘weight wise’. Now in its fourth year, the Weight Wise campaign aims to increase the awareness of the benefits of a balanced and varied diet in achieving and maintaining a healthy weight. Previous campaigns have focused on men (2004 Size Matters) and children (2003 Eat to be Fit). This year’s campaign (W8 Wise @ Work) aims to support health professionals, including dietitians, OHNs, health promotion officers and employers in delivering evidence-based nutritional and physical activity messages to employees. The BDA campaign links with a number of commercial agencies to bring evidence-based messages to the workplace. During 2005, sponsors include Canned Food UK, Food Fitness from the Food and Drink Federation, Kellogg, Kent Police, the Scottish Executive, Slimming World and Tesco. For the first time, the BDA will also be linking up with the BBC, under the BBC Big Challenge Health Works Award Scheme, to find the UK’s healthiest employers – a campaign which is being launched in June. During this campaign, evidence-based messages and materials will be used to promote the message, and although all workers are targeted, the campaign especially recognises the difficulties experienced by shift workers and their need for information and resources to support balanced eating during the night. Watch your waist size. For men, having a waist measurement in excess of 37″ (94cm) and 36″ (90 cm) for Asian men, puts your health at risk – this risk is higher over 40″ (102cm). And for women, a waist measurement of more than 32″ (80cm) increases health risk – the risk is even higher if your waistline is more than 35″ (88cm). Consume less high-calorie foods and drinks. The campaign will be supported by a National Media Campaign during June, with the focus on healthy lunch breaks and will dovetail with the BBC campaign. Limited copies of the campaign pack have been produced, and cost £25. They can be ordered by contacting Jackie Hardeman at the BDA (j.hardeman@bda.uk.com). Details of how further copies of resources can be ordered are included in the pack. The campaign is fully supported by on-line information (www.bda.uk.com), detailing a suggested stage-by-stage approach to getting involved with this initiative, together with suggested activities, timely media releases and evaluation tools. The Weight Wise website (www.bda weightwise.com) provides an invaluable resource to individuals looking for support to achieve and maintain a healthy weight. Launched in 2003, the site is supported by a grant from the DoH, and is written and managed by dietitians on behalf of the profession. Provided it is used for non-commercial gain, the site is available to link to employer intranet sites. The BDA also encourages non-commercial organisations and its sponsors and partners to provide a one-way link from their internet sites to the Weight Wise site during the extended campaign period. More details of the site can be obtained from the site co-ordinator by e-mailing Bdaweightwise@btconnect.com. OHNs wanting to access dietitians during June for activities can do so by contacting their local PCT (Primary Care Trust) or health board, or by visiting www.dietitiansunlimited.co.uk, the site that represents freelance dietitians working in the UK. 1. House of Commons Health Committee Report on Obesity. HMSO May 2004. Work with the catering team to deliver healthy meals in the staff restaurant and vending machines. Make the healthy meal the cheaper meal, provide fruit and vegetables at the tills, use swap food ideas around the canteen. Already a model employer when it comes to healthy diets, Slimming World will be looking at developing initiatives to help support employers and employees, including a workplace referral system. For further information contact Amanda Avery, one of Slimming World’s dietitians, at amanda.avery@slimming-world.com. Research shows that people who eat a regular breakfast, particularly a cereal-based one, are less likely to be overweight and more likely to have healthier diets.6 Kellogg will be supporting OH workers by providing a CD-ROM resource containing various materials to help them set up breakfast clubs in the workplace and motivate staff become more Weight Wise @ Work. To order copies of the CD-Rom or additional consumer leaflets, please contact 0800 626066, ROI 1800 626066. Kent Police are very enthusiastic about working with the BDA for the first time. Paul Smith, head of health services, says: “Kent Police is looking forward to collaborating with the BDA. They are helping us with our ‘Healthy Eating and Fitness’ promotion, which aims to encourage and motivate our 6,000 officers and staff to make healthy lifestyle choices.” Smith will be working with dietician Jean Barrass to implement diet-based workplace initiatives. The Scottish Executive will be hosting one the of BDA’s special media training days, helping to bring the message to employers and employees in Scotland. Working with local government and with key partners and stakeholders in the public, private and voluntary sectors, their healthy living campaign is building a national infrastructure that can support, encourage and enable individuals to make healthier lifestyle choices. Canned Food UK – an association that educates consumers on the benefits of canned food – will be working with member organisations to promote healthy living and eating practices in the workplace. Free recipes and nutritional advice supporting the campaign will also be made available to consumers and healthcare professionals at www.cannedfood.co.uk. Campaign chairwoman Toni Steer says: “We’re delighted to have so much support for this year’s campaign. 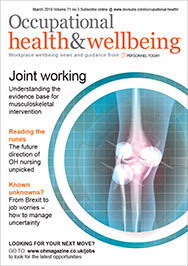 We hope the BDA and our sponsors commitments to encouraging healthy living, as well as our fantastic resources, will inspire you to launch your own W8 Wise @ Work campaign”. You can keep up to date with developments on Food First 2005 by visiting the BDA website at www.bda.uk.com.